This site now features a new page with references covering recent advances in computational philately. Topics include recent research references to stamp color analysis, perforation and separation analysis, perforation fingerprinting, color subtraction, and the direct digital differencing of high resolution stamp images in their entirety to show microscopic plate and printing differences, gross differences between stamps including cancels, and the relative distortion differences between individual plate impressions. 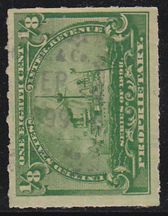 The Battleship Desk Reference (BDR) is a large compilation of printed and hand stamped cancels on the 1898 proprietary revenue stamps indexed alphabetically by the cancels. See the BDR section of this site for more information about the BDR. The full BDR database is online at this site. This can be accessed for research using any combination of the following: the cancel index; names of companies or proprietors; cities; and the full cancels themselves. Importantly, wild cards can be used in any of these fields except for the cancel index. Wild cards provide a way to search the database using fragmentary information from poorly legible or badly-centered cancels. Searching with fragmentary information is one of the most important uses of the electronic database. Be sure to visit and try the search feature on the BDR Search page. See how the cancel on the stamp at the right was quickly identified using this electronic search feature. This was the first finding of this cancel on the RB20. 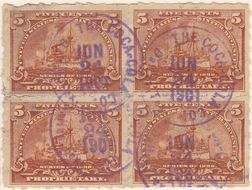 This site is being expanded to include information on cancels on the documentary battleships as well as other topics pertaining to revenue stamps. These topics will appear as folders in either the U. S. Revenues page or the Gallery page of this site. Specialty topics such as railroad cancels and double transfers are in development. 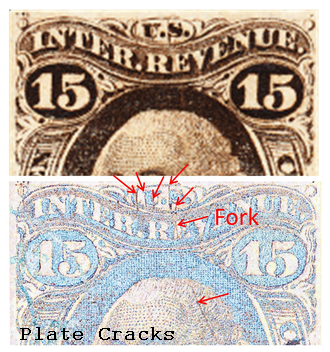 Special thanks go to John Langlois of 1898revenues.blogspot.com for recent contributions to the RR cancel listings. The latest addition to the site is a new index of "Wall St." cancels of stamps on document. This is mostly a 20th century database from stock and bond transaction receipts.